Did you know that termite damage to homes, particularly wood-based structures, is said to cost more than the damage resulting from natural disasters? To make matters worse, many homeowners purchase homes without performing a termite inspection. This is a big mistake, as they risk purchasing a home that’s infested. As termites cause extensive damage the longer they infest homes, it’s very crucial that homeowners spot the signs of termites before things get out of control. Below are 5 signs of termites you’ll want to look for in your home. When termites terrorize your home, they can chew on wood and furnishing to the point where the wood becomes seriously damaged. Since termites specialize in consuming wood from the inside out, you’ll most likely not notice damage by merely looking at the surfaces. You’ll be able to detect damage though by knocking the wood. Wood that is damaged by termites produces a hollow sound. To increase your chances of detecting these terrorizing termites, be very thorough in your search for signs. Tap shelves, furniture, wooden frames and walls to detect if any of these cellulose-based products produce a hollow sound. 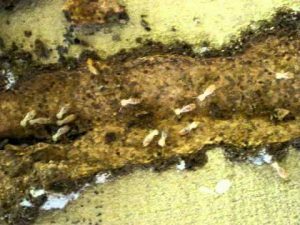 Another sign of termite infestation is the presence of termite droppings known as frass. This is produced by the drywood termite species. The droppings are usually the color of the wood they consume. Even if you don’t see the cream-colored bodies of these termites, you will likely notice the droppings. Each pellet is about a millimeter in length and is often found in mounds near the site of the termite infestation. If you notice frass, however, do not start using pesticides or other pest control chemicals immediately. This is because the frass may be the result of a dead colony. Contact a pest control professional to verify whether an infestation is in the works. You may also look for other signs of infestation before contacting an expert. When you spot mud tunnels on your walls or other wooden surfaces, you can almost be 100% sure than you are being terrorized by subterranean termites. These termites create mud tunnels using a mix of soil or mud which they access from their nests below ground. These tunnels enable them to travel in an organized and effective manner as they feed. The tunnels are also effective transport mechanisms due to the fact that they provide ideal levels of moisture needed for the termites to thrive. 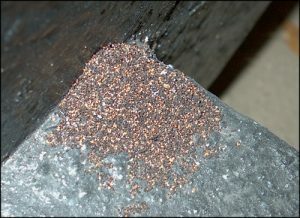 The main types of termites, including the subterranean and drywood species, feature swarmers. These are a kind of termite within the colony or termite population responsible for mating. Swarming termites are often seen near windows as they are attracted to light. When they mate, they later shed their wings near your windowsill or in other locations. If you notice these wings, be sure to inspect them as they may be the wings of ant swarmers in which case the wings would not all be the same size. If the wings are the same size, however, you can conclude that they are most likely from the reproductive male and female members of a terrorizing termite colony present within your home. Termites can sometimes be seen through cracks in wooden walls or other cellulose material. During an infestation, you may be lucky to spot termite workers, swarmers or other members of their colony in wooden trims or lumber. Spotting a termite is one of the surest signs of a termite infestation. In such cases, you’ll need to apply pest control measures according to the type of termite present, whether it is a subterranean, dampwood, or drywood species. Since you may find it difficult to distinguish one termite species from another, it’s best to hire a professional pest control expert certified and trained to identify these pests as well as provide specialized treatment. To prevent termite infestation, be sure to inspect any home you are considering to purchase to roll out signs of termites. In addition, fix leaks in attics, basements and other areas within your home as they may increase moisture levels in wood surfaces which will in turn, attract damp wood termites. This is some great information, and I appreciate your point that discarded wings can indicate a termite problem. My husband and I recently moved into a new house, and when I was cleaning in the living room the other day, I noticed a pile of insect wings on the windowsill. Knowing that it’s a sign of termites, I’ll definitely look into having a pest control professional come and take care of that before too much damage is done. Thanks for the great post! My mom has been seeing little piles of sawdust under her table each morning, and she is wondering if she has a termite problem. It is good to know that termites can chew on wood and furnishings to the point where the wood becomes seriously damaged. Learning that you will not always know the severity of the problem by the surface is helpful information. We will have to hire a pest control company to get rid of the termites in my mother’s home and keep her furniture in good condition.